Safety Linde ProtectorFrame: The protective overhead guard and its supporting frame together form a strong protective zone providing optimum safety and protection for the operator. Top-mounted tilt cylinders provide seamless and smooth control of the tilt movements for excellent load stability in all operating conditions. This unique design also enables slimmer mast profiles to be fitted for outstanding visibility. Reliability Proven in tough applications. Decoupling of mast and drive axle with chassis and cabine results in reduced shock and vibration. The enclosed robot-welded chassis is designed for maximum strength and durability. The resilient, maintenancefree mountings of the axles and tilt jacks cut downtime and operating costs. 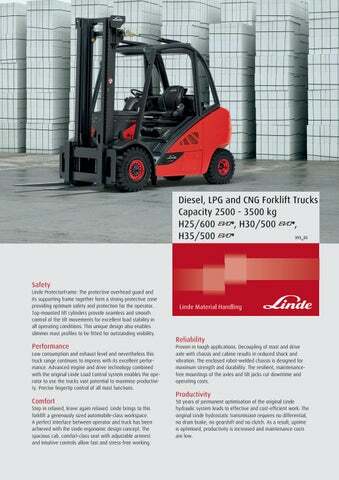 Productivity 50 years of permanent optimisation of the original Linde hydraulic system leads to effective and cost-efficient work: The original Linde hydrostatic transmission requires no differential, no drum brake, no gearshift and no clutch. As a result, uptime is optimised, productivity is increased and maintenance costs are low. Alternative lift heights available on request.